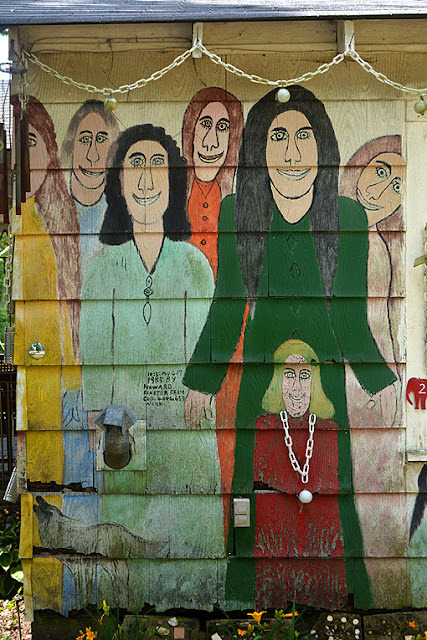 Many have seen Howard Finster's art at the High Museum of Art or the World of Coca-Cola or any number of other venues, but until you experience Howard Finster's Paradise Garden in Summerville, Georgia, I don't think you've truly experienced Howard Finster. At least I hadn't. I and my best friend Barry were guests of my beautiful friend and brilliant interior designer Summer Loftin, whom I first met in 2011 and interviewed in 2013. 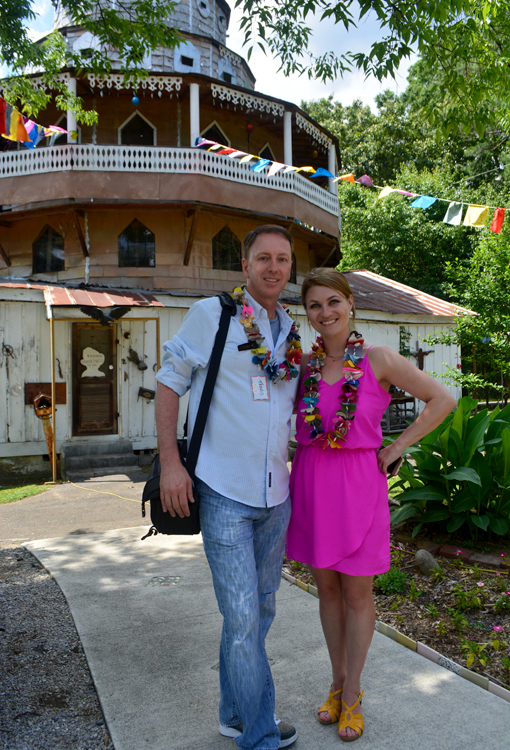 The sponsor of our Atlanta Bus Tour group was Jim Thompson of the Jim Thompson Thai Silk Company. "Thank you", Summer and Jim! What a wonderful day of making incredible memories. The day—and it was a full day—was magnificent! Here's a quick rundown of the day's events and then I'll share more about the Paradise Garden experience. We arrived at ADAC and were greeted with leis made of Jim Thompson fabrics, which we immediately donned and then joined our new found friends in a champagne toast to our sponsor and host, and to what we already knew would be a fantastic day! We enjoyed a Victory Sandwich Bar lunch on the bus on the way up to Summerville (the onboard activities were so well planned that the drive went very quickly). 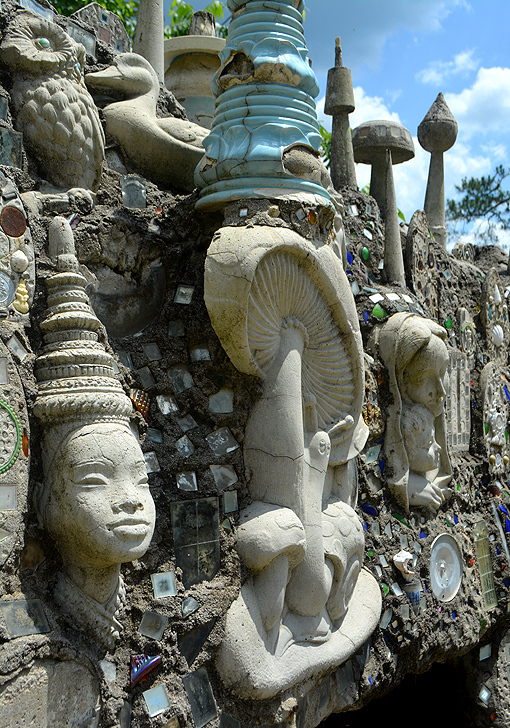 We arrived at Howard Finster's Paradise Garden, where we spent a few hours (I'm totally going back to explore more!) and just before left, we installed the projected we'd worked on on the way up. We then rode to Finster Fest! The festival has grown so much since its inception in 1992 that it's now held in Dowdy Park. In previous years it was held in Paradise Garden. 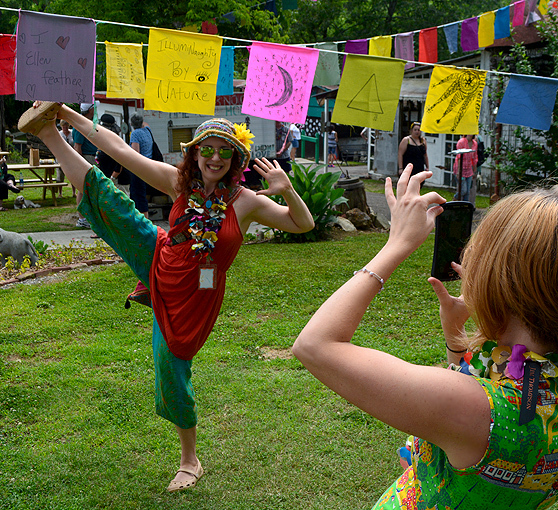 Finster Fest, which was great fun, is an art and music festival—a fundraiser for Howard Finster's Paradise Garden. From Dowdy Park we walked to the Couey House, built in the early 1840s, where there were a number of fantastic music groups performing. We sat in the shade with Summer and others from our group and relaxed and listened for a while. Now evening time, we went over to the nearby Summerville Depot, built in 1889 and now fully restored, where there was yet another music concert—"Tunes on the Tracks"...and Barry and I ate our BBQ on railroad tracks! That was awesome. One of the things that we did on the way to Finster Fest and Paradise Garden was to make prayer flags, something I can honestly say I never thought I would do. What an amazing opportunity to honor departed loved ones and recall beautiful memories while doing so. Our group made hundreds of them, which were installed on the World's Folk Art Church at Paradise Garden while we were there. 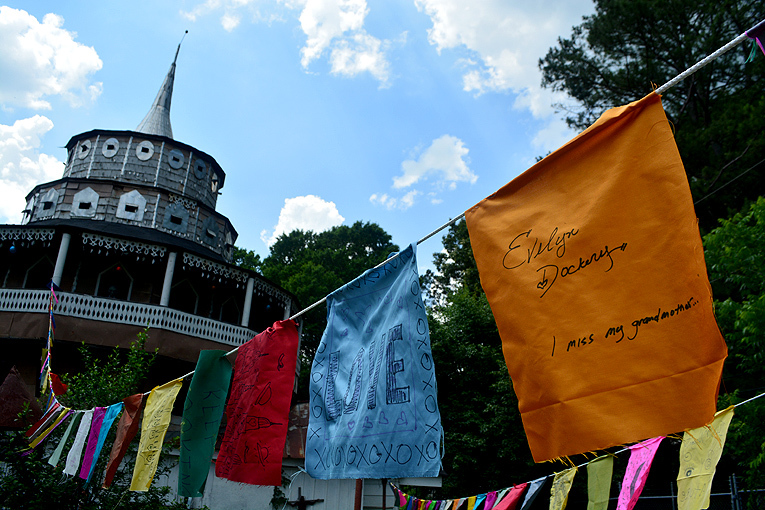 I made flags in memory of my grandmother, Evelyn Dockery (my mother's mother); my recently departed Great Aunt Kathy Burrell (my grandmother's sister and an award-winning poet); and one for one of my best friends who passed away in 1993, Todd Cleveland. Thank you, Summer and Jim, for the opportunity to memorialize family and friends I love. Finster's famous Cadillac, which I've shown only the front of in the above photo, features drawings of a number of well-known stars, so even as a Baptist minister, Howard was versed in pop culture. "I built the park because I was commissioned by God. I started the Garden in 1970 about one hundred feet into the backyard, built a cement walk and put up a haul shed and started to display the inventions of mankind. My park is a memorial to inventors. The inventors don’t get recognition. They don’t have an Inventor’s Day. To represent them, I’m trying to collect at least one of every invention in the world." 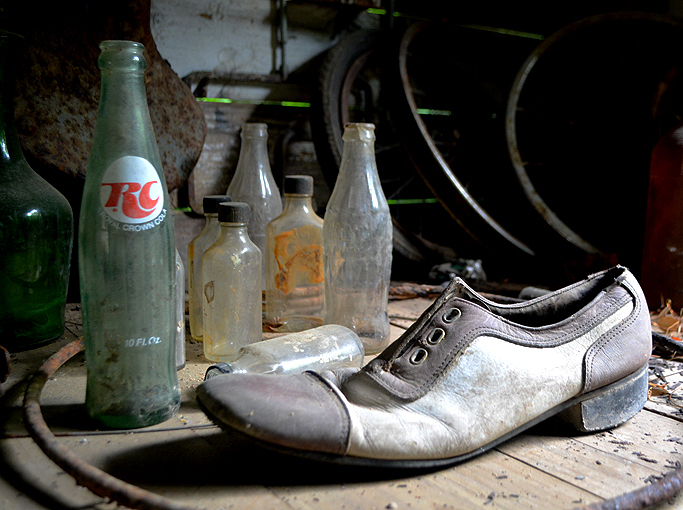 As it turns out, roadside museums were an influential part of Howard's childhood. My family moved around a lot when I was a kid, so they were a favorite distraction for me as well. They might even have influenced my own love for tourism. I wouldn't be surprised to make that connection, however I've never had a desire to create an attraction such as Howard's. Although this blog has become a collection of experiences, a collection I treasure. 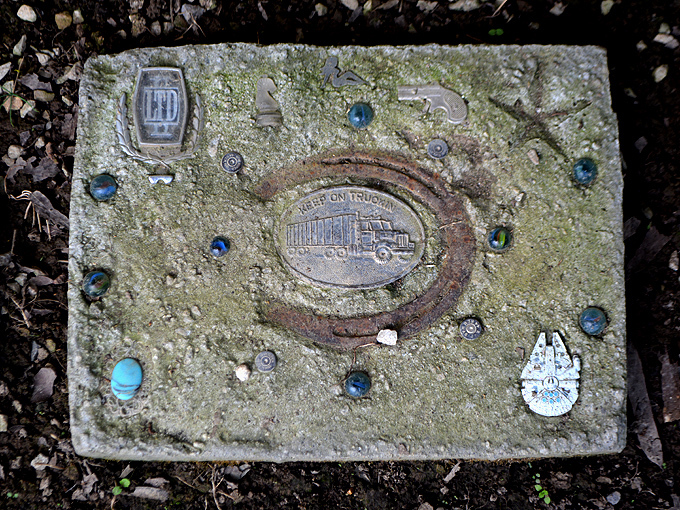 You can imagine how excited I was to discover that Howard had incorporated the Millennium Falcon, from Star Wars, into one of his works, right along with a "KEEP ON TRUCKIN" belt buckle from the same decade we first met Han Solo. 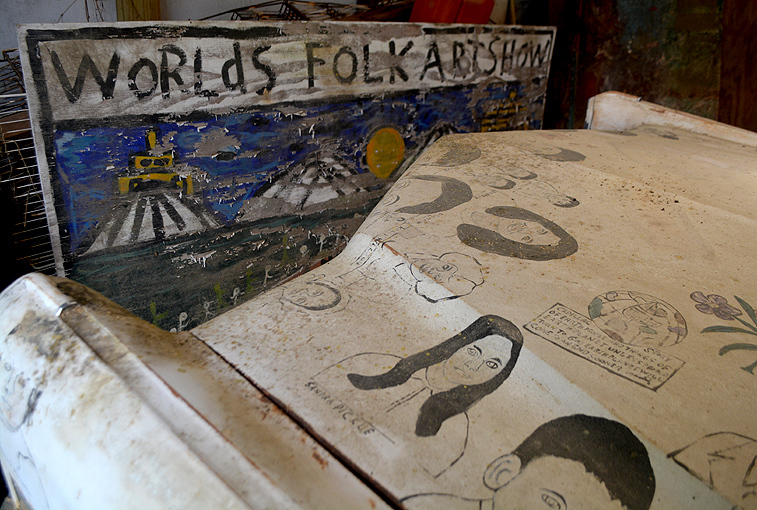 When you visit, I think you're going to make many, many memory-eliciting discoveries. I can't imagine there's anyone who can't find something that is personal to them, whether it evokes a memory of childhood, life experiences, faith, or even seeing a painted face that resembles your Aunt Mildred. Speaking of Aunt Mildred, I do have one, but, I didn't see her likeness in any of Howard's paintings. But his people paintings are certainly distinct. Once you've explored his work, you'll recognize it anywhere. In his lifetime—starting at the age of 59—he created nearly 47,000 works of art, so it's quite possible that you've already seen some of it. Howard was one of 13 children, as was my Aunt Mildred (on my biological father's side) and my own mother was one of 13 children that my grandmother raised. That's a LOT of kids. I sometimes still don't know how mother raised a grand total of three children! My first glimpse into the Mirror House, seeing all the green and gold, immediately evoked memories of The Peacock Room in the Freer Gallery of Art, a magnificent Smithsonian museum in Washington, D.C. The Mirror House is considerably smaller and it's folk art, not the majesty that the Freer offers, but it's still mesmerizing. If you've ever seen "fun" mirrors at the county fair—the ones that make you skinny, fat, big headed, etc.—you know that they really are fun. 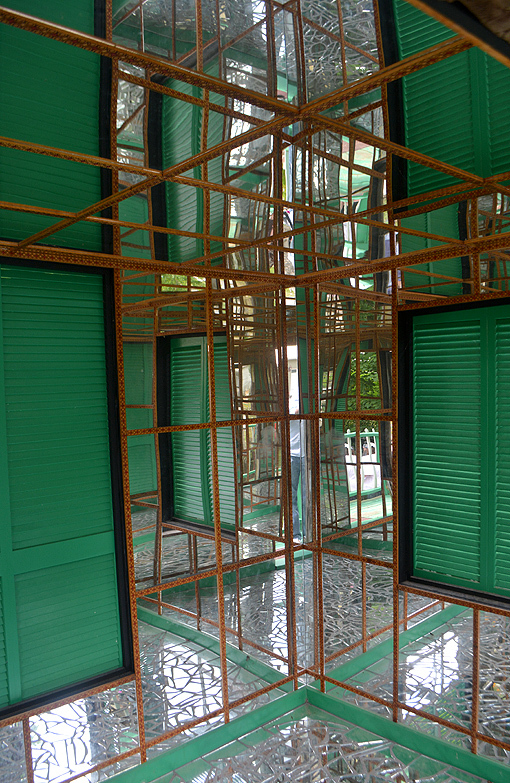 They do not, however, prepare you for the experience of the Mirror House at Paradise Garden. I'm not sure what its intention was, except maybe to let you see things in a different way...it's spectacularly dazzling. Warning, LADIES in dresses: The mirrors reflect to/from every direction! 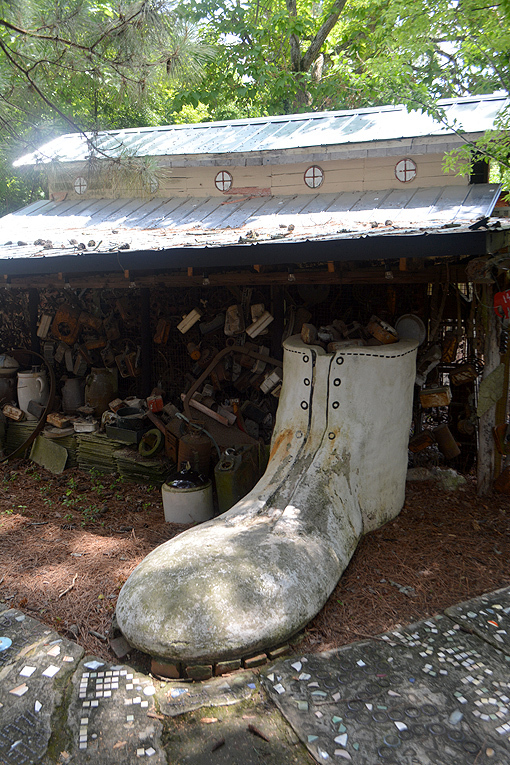 The Giant's Shoe is a visitor favorite. It's in nearly all the reviews of Paradise Garden that I've read and even when I was there, it was a popular photo-op locale. When we first arrived, I didn't know just how large Paradise Garden really is. I had assumed it didn't go beyond the Folk Art Church, but I was quite pleasantly surprised to discover that it goes on and on and on. I actually panicked a little when it started dawning on me how much there was to see and we only had a few hours to see it. This can totally be an all-day excursion, and a great place to bring a picnic! One of the surprises that I found shocking, remarkable and delightful was the discovery of so many cultures being represented in Howard's art. Having had certain conversations with Baptist ministers when I was a kid, this was the last thing I expected to see (the shock), but it gave me hope (the remarkable). It was indeed a true delight to see that perhaps Howard truly was inspired by ALL of the world. The story is that this (photo above) is Howard Finster's casket. A local funeral home had asked him what they could do for him and his clever answer was to give him his casket. Howard, being the man he is, invited people to write a note on a 2" x 2" piece of paper, sign the other side, and he would put all of those in the casket with his cremated remains (his reasoning for cremation are quite profound. I encourage you to look it up.). Unfortunately, his wish for his corporeal remains were not honored—having wanted to be cremated. Instead, he was buried in a nearby graveyard, later exhumed and moved to Alabama, where he was born. What a shame what he wanted for his remains wasn't respected. 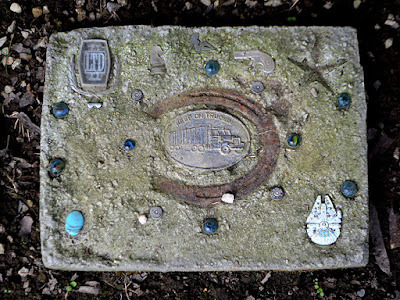 That's not the only nod to earthly remains you'll see at Paradise Garden. 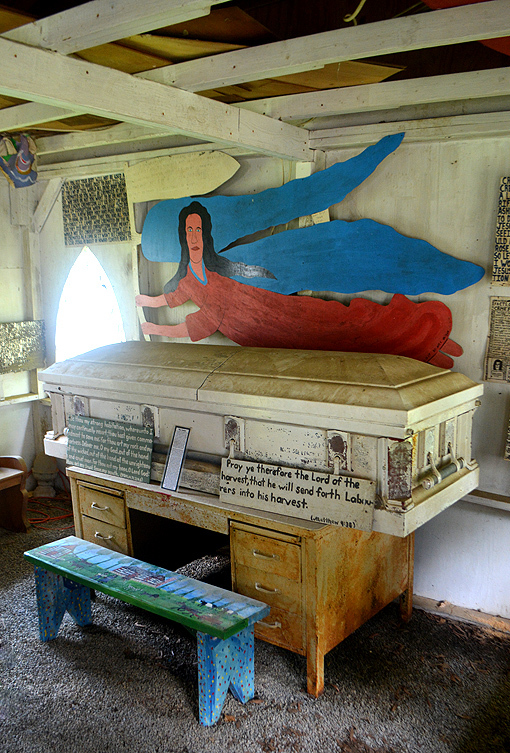 There's a crypt that Howard himself made that supposedly has the remains of an "unknown body" of Chattooga County, which is the county you're in when visiting Paradise Garden. The experience can't compare, but having visited the "Tomb of the Unknown Soldier" in Arlington, Virginia, Athens, Greece, and Moscow, Russia, this wasn't a new experience for me, but a rather unexpected one. But you'll get a lot of the unexpected in Paradise Garden, of the pleasant sort. A MILLION PIECES ALL IN ONE." There was also live music when we were there! A younger man and woman were playing for visitors. He was playing guitar and drinking from a mason jar and she was playing violin and had silver toenails. They were quite charming...I wish I knew if they have a CD or play for a band. They were fantastic and I enjoyed listening to them. The restoration and preservation efforts of the Paradise Garden Foundation is in its infancy, but you can already tell that there are many great things in store for the increasingly popular Georgia tourist destination. Paradise Garden is a place to relax, reflect and explore...lots of exploring! It's also a place of fun. That's Andrea and Teresa who we had the pleasure of chatting with later at the train depot just before the Tunes on the Tracks concert. This post may sound like a lot, but it's a mere fraction of what we did on our excursion to Paradise Garden. I think you'll enjoy the experience when you go. Howard was an interesting man, to say the least. Some might say he was a "divinely inspired artist and devoted man of God". Howard called himself "Man of Visions", and I'll leave that research to you. Personally, I have enjoyed his artistic legacy and find myself lost in the awe of it all. I can hardly wait to get back to Paradise Garden to continue the exploration! If Howard Finster's message and Paradise Garden resonate with you, the Paradise Garden Foundation will, with great appreciation, accept your help in their multi-year plan to renovate, preserve and restore Paradise Garden, be it a contribution, becoming a volunteer, buying a membership, shopping in the online store, or the best...visit Paradise Garden and tell all you friends how awesome it is! I'd like to again thank Summer Loftin for being such an awesome host (and friend) and Jim Thompson for his sponsorship of our day. I can hardly wait to go back to Howard Finster's Paradise Garden and spend a whole day exploring! Awesome what is there to say? What a cool bus trip. I didn't know they were doing that. My friend Summer, who was a delightful and awesome host, had invited me to come up many, many times and now having been, I can't believe it took me so long! It's an amazing place. It'd make for a great day trip, Terry.